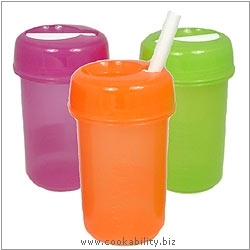 A range of vibrant beakers with integral flip top spout. The top unscrews for filling and cleaning. Great for packed lunches. For use with non-carbonated and cold drinks. Not suitable for children under 36 months. Sorry, but we are unable to offer colour selection on this product.